This (not-so-festive) Easter season is truly upon us. My home country, Kenya, has been ravaged by another radical Islamist attack. As we mourn those whose lives have been lost, we are reminded to be thankful for every breath that has allowed us to live to see this very moment. 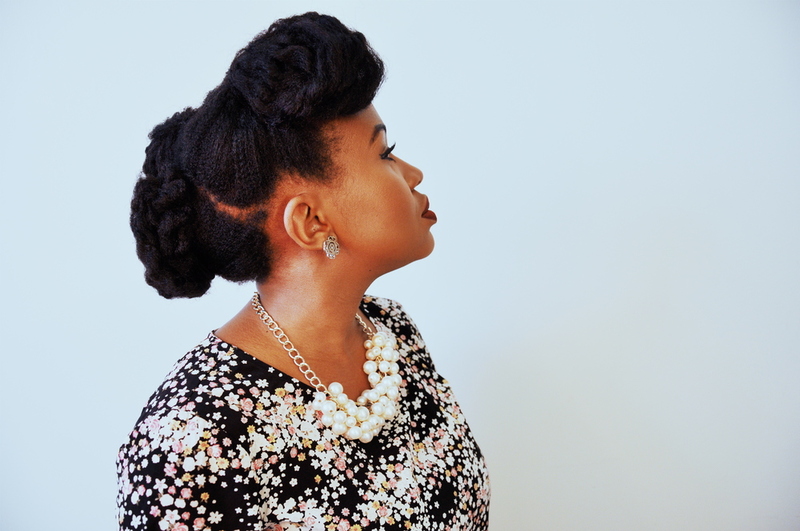 This hairstyle is the second in a series of three Easy Easter updo's. Because this time of the year is packed with events and dinners, the last thing you want is to be spending ages in front of the mirror trying to make your hair work with you! 1. Section off your hair into three. In line with my no-comb regimen, I use my fingers to make the parts. I made an asymmetrical ponytail with the front half of my hair and a low pony with the back of my hair. I secure each section with an ouchless hair tie. 2.Wrap your hair around the base of the area that you have sectioned off. This has the effect of creating a beret-esque pompadour. 3. Grab the other sections and repeat this process. VOILLLAA!! 4 C elegance...voo-vaa- voom!!! Have a safe one luvlee! Easy Easter Style : The Crowned Queen!